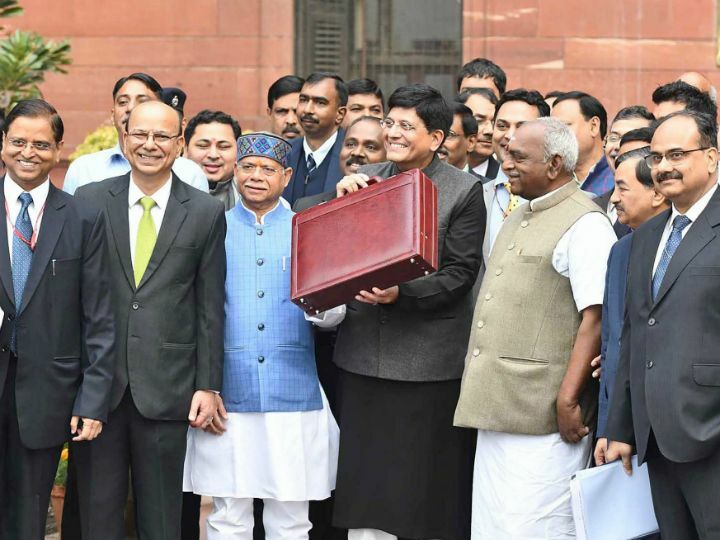 The Interim Budget prima facie looks like a blunt attempt to appease important sections and classes in India that could reap rich electoral dividends: with the limelight on the farmer, the salaried taxpayers, and the demographically strong unorganised sector. Departing from the convention that interim budgets must do no macroeconomic harm, it was an instrument to drive votes for the meeting of narrow political ends. This is thus, a textbook case of populism over prudence. The Union Budget allocation for 2019-20 is about 10% higher than that of its predecessor, with an outlay of ₹27.8 lakh crores. While most sectors witnessed a rise in allocation of funds in absolute terms, their share as a percentage of the total funds demarcated has fallen. Interest payments on debt accounted for the lion’s share in the 2020 budget: 24% (₹575,795 crores). Defence sector spending came a close second (₹284,733 cr), and was followed by subsidies (food, fuel and fertiliser subsidies), which totalled an expenditure of ₹264,336 crores (10-11% each). The budget was expected to primarily focus on a resolution to the agrarian distress, but the government went out of its way to ensure that the middle class and the informal sector workers did not harbour any feeling of being left out. Hence, the budget was mostly an appeasement budget; one laced with doles and sops- and hardly any revenue-generating schemes. Under the Pradhan Mantri Kisan Samman Nidhi (PM-KISAN) scheme, farmers who have holdings less than 2 acres will be entitled to an annual sum of ₹6,000 per family. The agricultural distress is a resultant of traditionally low rates of productivity, coupled with drastic price falls and low size of farm holdings. In an op-ed, C. Rangarajan writes how the average farm size declined from 2.3 hectares in 1970-71 to 1.08 hectares in 2015-16. This is a barrier to efficient use of modern agricultural methods, including mechanisation and other novel technologies like precision farming, which can push current production capacities to a new horizon. Thus, a price support mechanism must be put in place urgently. The government’s hastily announced PM-KISAN, while harbouring good intent, has several fault lines. A permanent solution can only be implemented once long-run considerations are taken into account. Telangana’s Rythu Bandhu scheme which offers ₹10,000 per acre, per year, is more inclusive and is a better choice overall. Odisha’s newly introduced KALIA scheme is also a step in the positive direction. The Modi government has come up with sufficient relief for the middle class, targeting especially the salaried group, and workers lodged in the informal sector. The Income Tax exemption limit has been raised to ₹500,000 from ₹250,000. This is a direct blow to the already frailty tax collections in India. Income Tax departmental data for the year 2017-18 showed that 66% of the return filers fell under the ₹5-lakh bracket. Hence, the move will wipe out almost 66% of all previously eligible taxpayers from the tax net, and is sure to dent any immediate prospects of tax-fuelled growth. The standard deduction limit has been raised from ₹40,000 to ₹50,000. The Pradhan Mantri Sharam Yogi Maandhan Scheme has been developed as a mega-pension scheme for the unorganised sector, which will pay ₹3,000/- a month to registered beneficiaries. The recent CMIE Report has highlighted how 11 million jobs were lost in 2017-2018 alone, out of which 8.8 million were women. Union Finance Minister Piyush Goyal announced that in a bid to fund the newly introduced schemes, the government would miss its fiscal deficit target not only for the upcoming year, but also for 2020. Governmental fiscal deficit for 2018-19 and 2019-20 would be 3.4%. In fact, funding the PM-KISAN scheme alone would entail a DBT burden of ₹75,000 crore to the exchequer. The NK Singh Committee on the FRBM Act, had proposed that the fiscal deficit was to be contained within 3.0% of GDP in FY18-20, 2.8% in FY21, 2.6% in FY22, and finally 2.5% in FY23. The government has thus, in the act of fiscal profligacy, sent fiscal prudence for a toss. Furthermore, while the government is overly enthusiastic about a sharp spike in GST collections, the fact remains that receipts from the GST is ₹1 trillion less than the budgetary estimates. Fiscal marksmanship analysis must be implemented rigorously and should try to close the gap between actual and predicted values.Arvind Subramanian mentions that while new schemes are constantly introduced, old schemes that are no longer relevant are hardly taken off the funding radars. This glaring error costs the government by causing fiscal leakage. For example, there is a ninety-six year old scheme, called the ‘Livestock Health and Disease Control’ (under the Department of Animal Husbandry), and it was alloted ₹251 crores in the Union Budget 2015-16. Moreover, pile up of new, expansive schemes pushes the government into higher debt levels. Celebrated Harvard economist Kenneth Rogeff, had predicted that countries with a debt/GDP ratio greater than 90% experience negative growth rates. This was evident through breakdown of Greece’s financial environment. Greece had a staggering debt/GDP ratio of 188% when the economy collapsed. India’s debt/GDP in 2017 touched 71.18% in 2017, and came marginally down to 69.55% in 2018. Thus, consistent and serious efforts must be made to bring down the debt levels. Global rating agency Moody’s has marked India’s interim budget as “credit-negative”, underscoring the fact that it has only give-aways and little to recover from. Business tycoon Anand Mahindra remarked that the budget was a “pump-priming” exercise for the government, as higher incomes would lead to greater consumption and drive growth. In my opinion, several schemes that have little rational base can be wiped off and their funds can be relocated to more efficient schemes. For example, farmer support which has been pegged at ₹6,000 can be increased if fertiliser subsidies are decreased, as excessive use of fertilisers and soil enhancers takes a toll on the long term farm productivity (we are over-discounting fertilisers in any case). Disregard for fiscal discipline, especially in times when the chilly winds of protectionism are blowing all over the global economy, is a dangerous trend. As Paul Krugman puts it aptly, it is prudent to maintain “profligacy in depression, and austerity in good times”. Well said!